The biggest single musical holiday event of the season and a critical fundraiser for the Pike Market Senior Center & Food Bank, The Great Figgy Pudding Caroling Competition kicks off the month of December with a wonderful evening of entertainment enjoyed by more than 9,000 spectators every year. 1,000 carolers and dozens of caroling teams sing their hearts out on downtown Seattle street corners and in and around Westlake Center beginning at 6 pm. The top caroling teams compete for crowd favor as well as prizes for the most donations raised, best choral performance, most creative team, and people’s choice. Those nominated compete in a sing-off on the Figgy Main Stage. A Seattle holiday tradition, the Great Figgy Pudding is a zany, family-friendly and delightful holiday event for everyone. Caroling teams range the gamut from dancing lawyers, to costumed co-workers of Seattle landmark businesses to Von Trapp-like families. 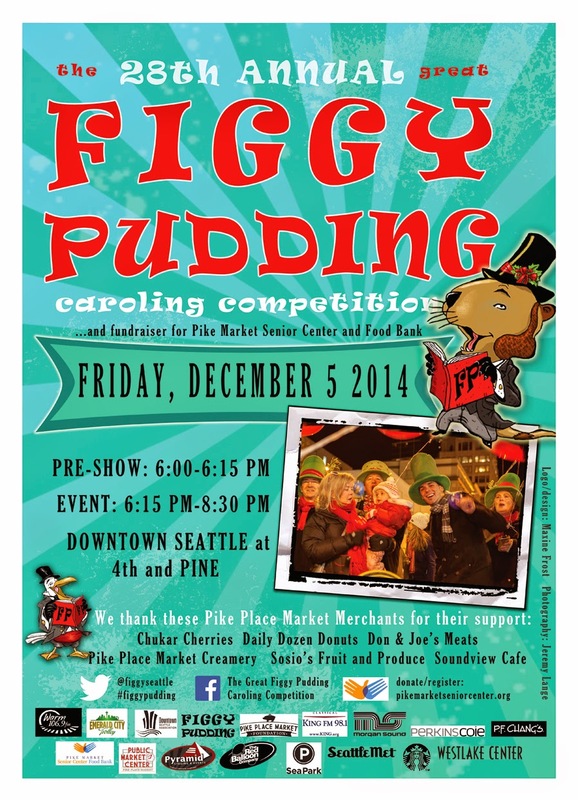 Figgy Pudding is the primary fundraising event for the Pike Market Senior Center & Food Bank every year. Our organization has a focus on food access in Seattle’s downtown core, providing 650 families with groceries each week, and over 4,500 meals to seniors each month. Additionally, our senior center offers programs aimed at holistic senior health and wellness. There’s no better way to simultaneously give back and have fun this holiday season. Come and help us get Figgy with it! Look no further for enchanting San Francisco restaurants with top-notch food, the most caring staff, and the most unique space. You can’t find a better venue. Nice place and amazing food! Service was fast and everything came out fairly quick. If you're in the area stop by. The space is very decadent and has the usual elegant feel. Great to reveal starbuck secret menu when relatives come to visit.